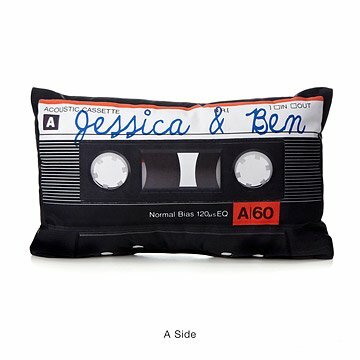 Curl up with a bit of nostalgia and enjoy this personalized indoor/outdoor, mixtape pillow. Back in the big-haired heydey of cassettes, there was nothing quite like finding a mixtape in your locker, rushing home to your Walkman, and listening to a musically-coded love letter. Curl up with a bit of nostalgia (and maybe dust off your classic road trip mix from your freshman year) and enjoy this retro indoor/outdoor, double-sided pillow, personalized with your name, high school moniker, or your nickname from your sweetheart. Made in the USA. Both A and B sides of this pillow are customizable. Huge hit as a birthday gift! Great retro gift. Just be aware its not a good last minute choice as it takes 2-3 weeks to arrive due to personalization. Size is not too big and not too small, detail and writing are beautiful. The design is solid and the handwriting looks authentic. It's the perfect size to use as a decorative pillow on our bed. I love that you can put custom wording on each side. I was thrilled to find something fun and romantic for my husband after drawing his name in our family's gift exchange! It's so cute. Little small, but still good for a decorative pillow. New go to wedding shower gift! Exactly as described! Very cute, love that we could personalize it. Super fast delivery. It's a great gift for someone, but the customer service I received for about a month trying to resolve my personalization issues, were a little ridiculous. Makes a great unique decorative throw pillow for the couch or bed; love that it is machine washable. My husband's birthday, after 42 years I needed something special & we lived through cassette tapes & most important he is in a band! Which means that for Christmas I will be purchasing the matching rug, I know he will love it . I purchased the rug that looks like an amp., (and had his name put on it) for Christmas last year. He really loved it and it has not hit the floor yet! He keeps it on top the table with his affects and mixing board!